Racing is expensive. The cars, the trucks, the tires, hell, even the snazzy polo shirts with a little logo on it all cost money. But it’s always been a mystery just how much money. Until now. Here’s the story of how one team spent more than $150,000 on all of it – and that’s just for one race. Modern motorsports requires massive financial and logistical resources. There’s not only the race car, but the engineers and mechanics. Same goes for the catering, the flights for everyone to get to the tracks dispersed all over the country. And that’s before you get into the fuel and tires, which cost you a decent chunk of change for a bit of autocrossing and thus cost many multiples more when you’re at a real race track. Everyone knows racing costs a lot of money. What everyone generally doesn’t know is exactly how much. There’s always been a big disconnect between what fans see in the stands and on TV and what really goes on behind the scenes. But we’ve been given an exclusive look into the shadowy world of racing finance and we’re going to tell you as much as we can. Performance Tech Motorsports, founded in 1982 by team owner Brent O’Neill, races a car in the Prototype Challenge class of IMSA’s Tudor United Sports Car Championship. PTM isn’t some backmarker, bringing up the rear in every race as it squeezes what it can out of every last dollar. Just last week, PTM drivers James French and Conor Daly captured pole position and a second place finish at Road America. Daly would have walked away with the win, too, were it not for ending up on the wrong end of a nail-biting finish. But you need to spend money to get those kinds of results. And for reasons that are still a little unclear to us, but for which we are extremely grateful, they gave us a quick peek at their books. We agreed not to divulge the exact totals of how much everything costs for competitive reasons, but we can give you some of the nitty-gritty details. “Nitty-gritty details,” in this case, means staggering dollar figures for seemingly mundane things that will make your bank account weep unless you’re a regular Pebble Beach attendee. To give you a sense of what it costs we’re going to look at the cost of just one, single, solitary race weekend. We’re not children, however, so let’s start with a good race weekend: The 24 Hours of Daytona. America’s greatest endurance race, it’s a grueling challenge that’s part of the Triple Crown of Endurance Racing. For the team and fans alike, it’s more than just a day at the track. In fact, it’s six days at the track for nine people. All of those people need hotel rooms, so that’s $5,670 out the door. All of those people need to eat and deal with a bunch of daily expenses, too, so that’s another $2,100. But first you have to get everyone there, so $1,800 is spent on airfare. So that’s $9,570 that has already been spent and the car hasn’t come near the track. Some costs are actually cheaper than normal, as PTM is based in Florida,the same state where the race is being held. But you still need to get the racer to the course, so $1,100 is spent to lease and operate those big fancy transporter trucks, where the car is nestled inside before the race. Oh right, about that car getting on the track. The race requires an entry fee of $15,650, or about the starting price of a new Fiat 500 if the dealer gives you a bit of a break. And with that, you’re going racing. Well, it’s not that simple. Actually racing is incredibly expensive as well. The costs for repairing, replacing, refurbishing, and rebuilding everything that goes wrong during the race need to be factored in. So for the chassis, the brakes, the paint on the car, the engine, and the gearbox, you’ll basically be paying for a nicely equipped BMW 3 Series. And you’re going to want to fuel the car up for that 24-hour race, so be prepared to drop over $12,000 for the privilege. But those aren’t even the biggest cost. The biggest expense, by far, is tires. I’ll let you take a few guesses as to what a couple sets of tires will cost. Alright, what’d you guess? $20,000? $25,000? $30,000? For the 2015 Daytona 24 Hours, Performance Tech Motorsports says they dropped $50,000 on tires alone. All in, PTM spent the equivalent of a very generously optioned Aston Martin V8 Vantage S, simply for the opportunity to race at Daytona. And somehow, the team actually makes a profit off of all of this. Brent O’Neill, the owner of PTM, is a bit of a rare breed himself in the racing world. 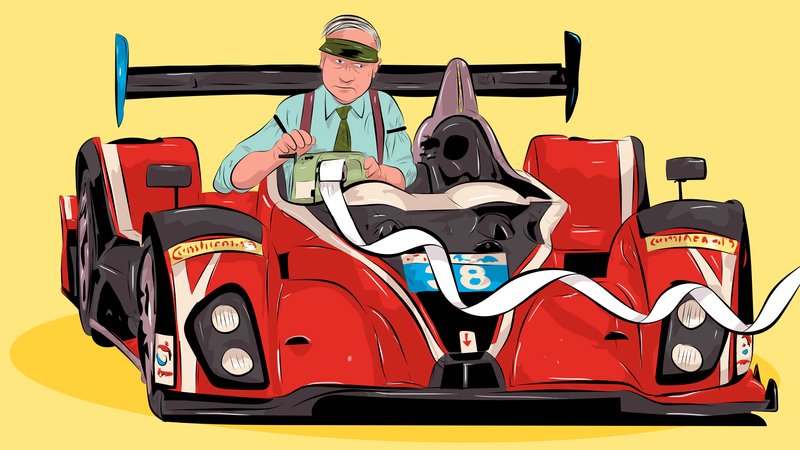 His great-grandfather didn’t win 17 Formula One world championships, and no one handed him a team. He dabbled in racing himself, racing karts from age 13 or 14, though it wasn’t the horse racing his grandfather originally envisioned. Starting at such a late age in karts, however, isn’t the optimal way to make it into the top tiers of racing. So by the time it came to go to college, he was accepted into the University of Miami. While on the road with Courtney, he received his first chance to get behind the wheel of a race car. But again, the realities of life got in the way, O’Neill told me. Racing is fun, but if you aren’t the fastest guy out there, then you need to start planning for the future. “I realized that there were young kids come along, and I’ll be out of a job one day,” he said. “And the kids will be faster than me, so I’ve got to start my own shop.” That was more than 25 years ago, and to this day, O’Neill stills owns the team in its entirety, and the whole operation is completely debt free. O’Neill said that it helps that he doesn’t own a million-dollar house, and he doesn’t drive a million-dollar car. He actually owns a Ford F-350, which he uses as his daily driver. And owning your own shop and owning it debt free is all very well and good. But as we’ve already established, racing is enormously pricey, and if you’re going to make any money off of it, the capital needs to come from somewhere. “The funds mainly come from the drivers,” O’Neill said. James French, who set last week’s pole position, has aspirations to the top level of racing, and his father was able to contribute some “seed money” to get James going. “Seed money,” in this case, means that not only the cash coming from James, but his talent, as well, help bring in extra dough. If other drivers and sponsors see that credible capital and drivers are joining a team, then they’ll want to bring their capital and talent as well. Drivers and sponsors, like Dash Express, want to be associated with success. Some companies like specific drivers, with Conor Daly having a particularly close relationship with pork company Smithfield Foods. Drivers coming up the ranks, who race in the IMSA Prototype Lites series, also contribute to the bottom line. Sponsors don’t just pay for their name on the sides of the car, either. They pay for events at the race tracks, bringing in clients for parties, all of which generates money. And when it comes to racing prize money, O’Neill says not to count on it. It’s just too unpredictable, even when you have fast drivers like Daly and French. Other costs, that most people wouldn’t think of, are defrayed by the nature of the business. All of the drivers provide their own health insurance. All of the mechanics have their health insurance covered by the team , except on race days, when they’re insured by IMSA itself (here’s IMSA’s insurance requirement for the Detroit Grand Prix). For the icing on the cake, PTM sells its old race cars, and services trackday specials and club cars for customers. One guy wanted to turn his BMW E46 M3 into a track car. Three weeks and $18,000 later, he had his caged racer ready to go. Another wanted to turn his Chevrolet Corvette Z06 into a full-on race car, complete with track instruction. Four months and $60,000 later, he was ready to compete. O’Neill wouldn’t disclose just how much money the team actually makes, but at the end of the day, he says it’s profitable. And when it comes to keeping a business afloat, that’s all that matters. While the biggest race of the year can seem exorbitant in its own right, it’s nothing compared to the price of a full Tudor race season and its 56 days at the track. Again, tires are the biggest cost, with all 90 sets of tires used over the race season setting the team back $225,000. That’s $2,500 a set, or $625 for a single piece of rubber if you bought it off of TireRack. Fuel, at $41,075, costs almost as much as engines, at $43,000, which costs almost as much as transmissions, at $43,500. Clothing costs $2,750, and hotel rooms cost damn near $40 grand. Entry fees are structured unusually, as well. IMSA’s standard entry form says that appearing at the Roar Before The 24 Hours of Daytona will cost you fees of $2,500. But Brent says that it’s not so simple. “I wish it was $2,500,” Brent said. But “we have to write a check in December to NASCAR for $35,000 to be considered a full season entrant, and then we get a small discount through the year.” So by the end of the year, a full season ends up costing $104,850 in entry fees alone. For a whole season, an entire race team costs about a million dollars, give or take a couple hundred thousand depending on the year. And that’s in a year where they don’t have to buy a new car, which costs around $400,000. In context, the team’s costs run around the middle of the pack. We reached out to one of our resident Jalopnik hot shoes/racing drivers/hoverboarders Robb Holland, who said that everything looks about right. Fuel expenses are on the high side, while clothing costs are on the low side, and if you want to win every race, you drop an extra $50,000 here and there. Of course, not every team wants to win every race. O’Neill told us that teams will cut corners here and there to minimize costs – running tires until the treads are dangerously worn down, running brake pads and rotors until they’re past minimum levels, outsourcing engineering work. But when all is said and done, when the checkered flag is waving, and the champagne is spraying for you and your team, you’ll know just how much it costs to make it all happen.